The video was captured of the desk in one of the lecture theatres at the Old Government Buildings at the University. The audio was recorded separately and had to be synchronised. The video quality is poor but you get the message. The former Prime Minister who oversaw the vicious austerity program in the 1990s that has severely damaged New Zealand was in the audience and at private meetings after the presentation. He told RadioNZ some time ago that he now believed that neo-liberalism has failed. New Zealand has around 1/3 of its children living in poverty. I think the former Prime Minister’s statement is an understatement. The presentation video runs for 58 minutes including the little reggae introduction and closing. The RadioNZ promotion for the segment was as below (8:38 being when they ran the segment, the mugshot taken in the entrance area to the studio in Wellington). The graphic is taken from program’s WWW site. The interviewer was Wallace Chapman who hosts the Sunday Morning show, which is very popular in NZ. Thanks so much for coming over to NZ Bill. Can’t tell you how important it was to have you here. Apart from the excellent presentation and radio interview, were you able to make any headway in your private meetings? I really hope so, because as you say, child poverty in NZ is a disgrace and somebody should be held to account. Brilliant presentation as always Bill. Thank you. New Zealand; public debt at about 30% that they have the ambition to squeeze to 20% at 2020 and then further on to 10%. Budget surplus, negative current account and record high private debts, what could possibly go wrong? They don’t do sectoral balances analysis? Main stream economists are like construction here in Sweden, we just had a concrete casting frame (don’t know actual terminology) for a bridge collapsing (15-20 workers injured, pure luck no one was killed), as one from construction academia said, construction is not a learning industry, we do the same mistake over and over again. Great presentation, everything was clear and easy to understand. Shall do what I can to spread the link. I too was thinking how clear Bill’s explanations of the various issues was and how to use these presentations to spread the word. I thought about going through them and making a list of the issues and of the explanations in terms of the time in each video where the explanations are given. Using the youtube extension to the webpage address by adding for example &t=17s=22 you can link directly to the relevant moment in the video. Might be useful. The stats show a lot of damage was done in the 90’s, 2000’s. Unemployment would be higher in NZ if it were not for migration in search of work. Baking the very bad situation look superficially slightly less bad. Same dynamic as observed in the eurozone. Can you please link to a blog post or hit me over the head with a simple explanation of an alternative approach to how NZ should have addressed the high inflation shown in the unemployment and inflation graph at about 49:18? I have read in other of your posts and in the Land of Plenty movie you posted about how forcing high unemployment worked to lower inflation, but it obviously had a high human toll, but I am unclear on a preferred alternative when you come upon a situation with inflation over 10% and almost no unemployment. Is it your position that inflation in the 10-20% range is not a problem? Or that the raising of interest rates coupled with a job guarantee would likely have worked? What do you make of The Opportunities Party? Do they offer something unique, or is that still more of the same in your view? Thank you. You discussed earlier in this video how the government can buy idle labor and that inflation only rises if real resources (people, raw materials or something else) are not available. But what about when there already is high inflation but no available people? The fewer idle people there are, the less idle labour the government needs to buy. The job guarantee is an automatic stabiliser. A negative feedback mechanism. Thanks for the response. I understand the job guarantee concept. What I don’t understand is what is a government to do when it finds itself in the situation of NZ where there is high (10-20%) inflation and also very low unemployment. NZ’s solution to the high inflation resulted in very high unemployment, depressed real wages and general suffering. What solution could they have used that did not result in those bad side effects? Steve it depends what’s causing that inflation. Is it oil imports? If so then Warren Mosler wisely suggests that governments should do long term contracts for oil so it’s stable rather than leveraging the whole economy against the price of oil. When was this period you say with no under or unemployment? There is a graph at 49:18 of the movie. Looks like from 1975 to 1980 inflation was over 10% with unemployment under 2% with the problem really beginning about 71 and going until about 88. I see a lot of inflation due to oil 70-80s in that graph in New Zealand. It’s all oil. We should have long term energy contracts unlike this neoliberal nonsense. Why hedge out countries against fossil fuels. Hedge them off of our human capital instead. 3) There’s always going to be some disaster that people can’t predict and hedge against – so my question still holds: If you’re in a position with 10-20% inflation and almost no unemployment, what solution other than jacking up interest rates and hammer down wages and employment? Or is the answer that 20% inflation is not a problem? 10-20% inflation if it carried on for any length of time would be very problematic particularly psychologically. But when is this period of zero underenemployment and unemployment you speak of? When is this period and how long did it last? Any links or is this an imaginary problem? Thanks easy to understand for someone like me not familiar with economics. Have you ever come across the book ‘Pattern Language’ by Christoper Alexander ( a mathematician interested in the built environment)? It is a important book for both architecture and computing (information systems). Basically in the book write about the premise that you can’t solve all problem in the built environment by logic. It is based on tradition what has worked previously. The book lays out a language (that is hierarchical) that describes the ideal patterns of built environment. Why are computer programmers interested in the book? Well code also can’t be written by logic we reuse patterns and pieces of code that has worked in the past. A common Language is important passing on patterns that work. It sounds very similar to what you say about neo-liberal economics by controlling the language you control the discussion. There is a graph at 49:18 of the movie that shows very low (under 2% unemployment) from 1970 to 1980. There are numerous posts here addressing inflation concerns. The ‘Debriefing 101″ and “Inflation” categories might have the information you seek. Not sure I have an answer, but I do have a lived experience of Australia’s pretty similar situation in the 1970’s. In 1972 my parents bought a new build house in Brisbane for $14k when they had a combined income of around $7k. By the early 80’s, this house was valued at $140k and my parents were earning around $70k. Similar ratios, but they still only had debt on the original $14k cost. Actually, it was paid off and a holiday property bought. So I have never seen the mid-teens inflation of the 70’s as such a huge problem, unless you were a banker regretting that people should be let off your hook so easily. To use this inflation as an excuse to toss 5-10% of the population on the job scrap heap and obliterate entire economic communities was despicable. Great presentation, wish the ABC in Aus would do the same. Steve:If you’re in a position with 10-20% inflation and almost no unemployment, what solution other than jacking up interest rates and hammer down wages and employment? Or is the answer that 20% inflation is not a problem? Steve, much of the problem is contained in the assumptions of the question. 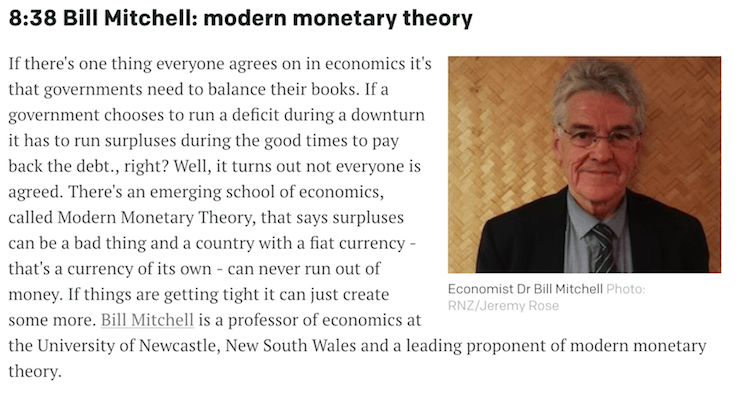 (A) MMT is not magic. If there is some real external “exogeneous” reason for 10-20% inflation – a (continued) rise in the price of some imported necessity, say – good policy can forestall or ameliorate the damage, not snap its fingers and make it go away. “Almost no unemployment” is quite rare. Only seen in the USA in WWII, only approached since then in the late 1960s. A country might choose to have some temporary inflation to reconcile incompatible claims, to distribute the harm. (B) The worst assumption is that unemployment, magically, always directly fights inflation. (C) The second worst assumption is that interest rate hikes similarly directly fight inflation. The main mechanism is producing unemployment, which lowers demand, which fights inflation. (D) Next is forgetting alternative policies – government browbeating (JFK vs Big Steel), prevention – e.g. commodity buffer stocks, as were abandoned in the USA just before the inflationary 70s. They could help against imported oil shortages etc, and provide time to restructure. Schemes like Abba Lerner’s MAP (market anti-inflation plan) or similar ones. Countercyclical lending controls in addition to interest rate hikes and which probably work better. Spending cuts, minor or major. And for serious cases, price controls. Less negotiable “war bonds” soaking up excess money, major tax hikes and forced savings programs are for serious cases too, but they probably need wartime levels of patriotic fervor and unity to work or be passed. The raising of the interest rates would be a tool of the state to create unemployment, as a tax hike or spending cut would. (“No prosperity, however robust, cannot be dealt with by a sufficiently large tax hike or spending cut.”) Then the JG would step in to provide lower wage employment. Some wages would be hammered down- but not to zero as for the selected sacrificial victims as in today’s style. To a living wage. Note that the real “hammering down” is caused by whatever the external cause of the inflation is. And that inflation might have effectively lowered many wages in real terms anyways; that is one of the ways it solves such real “hammer” problems. The reason this should work – better than today’s crazy policies, including anti-inflation policies – is that a JG should be a better anti-inflation buffer stock than unemployment, and the evidence imho is that it is. This goes under (B) above. In the long run, after a temporary, brutal drop in demand, unemployment doesn’t fight inflation, it exacerbates it. The idea that somehow people not working will magically provide more for everybody else, lower prices is bizarre – “lunacy” (Wigforss), something you need ‘to have fuddled your mind with nonsense for years to believe’ (Keynes). So smaller, less painful changes would be needed under a JG policy for the same inflation-fighting effect than under an unemployment policy. Similarly, falling under (C), excessively high interest rates can feed inflation, not fight it. The bondholders will have that much more money to chase goods with in the future. That is a feature of chronic, Latin-American style inflation, or Italy at times. MMT economists recommended Italy lower interest rates (in the 90s I think) to fight inflation. MMTers generally promote ZIRP, low rates. Example: Partly through Keynes’ influence, WWII was financed with low rates and interest rate caps, unlike WWI – and the bigger war saw more success against inflation. So something like your answer (E) above would probably be the first MMT resort, and it would probably work in most situations.